Homeowners often think that installing tile diagonally in their bathrooms involves too much cutting or that the layout will look too busy. Diagonal tile seems like it belongs only in spacious rooms. Nothing could be more wrong. 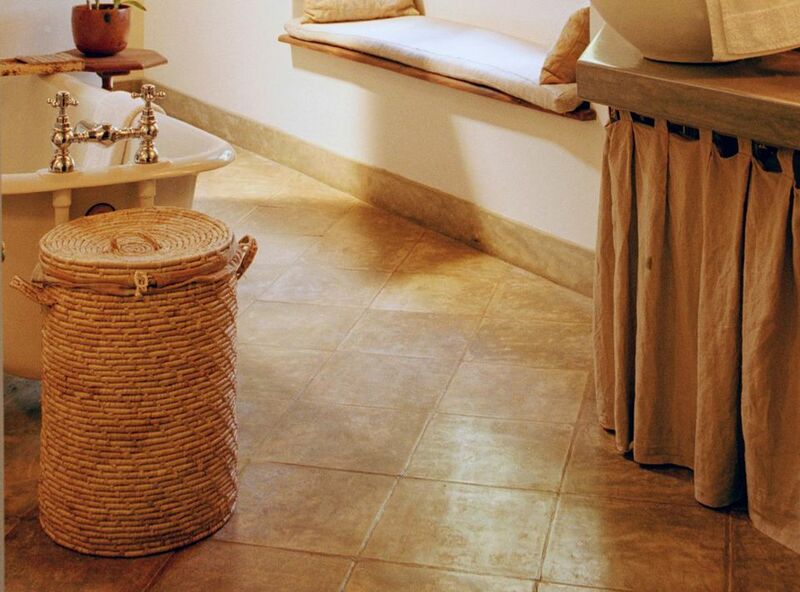 A diagonal tile layout is not just acceptable but can be preferable in a bathroom or another small room. While it may not seem possible, diagonal tile positioning can actually make your small bathroom look bigger. It's true that cutting on the diagonal will always be more difficult than cutting parallel to edges, but there are tools and techniques to help you do this. Your brain unconsciously approximates tile quantity. Diagonal positioning confuses the brain's tendency to do this. Whether you know it or not, you count tile. You might be the literal type who sits on the toilet and in your boredom counts tiles. Most of us have elementary math so engrained in our heads that, when we see 4 tiles long by 3 tiles wide, we instantly know the total: 12. More likely, though, your brain unconsciously takes note of tile square footage the moment you enter the room. It's something that we all learn in our early years of cognition. Bathroom designers tell us that diagonally-placed tile is virtually uncountable because it breaks up easily-recognized patterns. Parallels and squares are prison-like. Diagonals have a more open look. This is another way the shapes and patterns in our world affect our unconscious brain. The "V" shapes afforded by the diagonal tile layout create an "opening" effect. By contrast, the grid-like pattern of perpendicular installations looks more boxed-in and like a jail. You only need to look at wall tile laid harlequin style to see how vibrant and fun diagonals can be. One criticism of diagonal tile is that you need to cut tile for all four walls. Yet parallel tile isn't much better. Besides, there are tools and techniques to help you measure and lay diagonal tile. Laying tile diagonally means cutting off corners. Every tile that meets a wall must be cut. But with tile laid parallel to walls, you won't reduce cutting by much. In many cases, you'll still end up cutting tile along all four walls. When your first row of tile begins in the center of the room and projects outward toward the walls, it would be a miracle if the edge of the tile happened to perfectly meet the wall without any cutting. So, don't rush toward this conventional tile layout just because you think it will be easier. A tool called TileRight helps you measure out those diagonal cuts perfectly. Much residential tile falls within the 8" square to 12" square range of TileRight's TR0004 tool. If your tile is in the 12" square to 22" square range, then you'll need the TR0002. Buy From Amazon - TileRight Measure Right 30"
Tile sizes above apply only when the tile is laid diagonally. The second thing to do is rent or purchase a wet tile saw. This makes cutting tile a nearly effortless process. Instead of making difficult "breaks" with a snap- or rail-type tile cutter, you cut the tile with a spinning saw blade. Plus, it's a clean cut with none of the ragged edges associated with the snap cutters.